S60 Digital Ultrasonic Flaw Detector is a highly efficiency portable, intuitive instrument. Its blend of efficient menus and direct access keys allows you to take advantage of the highest quality flaw detection platform with exceptional ease of use. -Simple to use, quick to operate, from basic to challenging inspection re­quirements. -From high frequency inspections for thin materials to low frequency for attenuative materials. -From automotive, power generation, oil and gas to aerospace applica­tions. -Zoom: Expands A-scan display area for increased screen resolution. -Magnify: Expands area within the selected gate over the entire display range for increased A-scan resolution. -Data memory: Maximum 512 datasets store instrument setups or reports including operation parameters plus A-scan, the stored datasets can be easily previewed, recalled and exported to a computer for edit and printing. -DAC / TCG: DAC (Distance Amplitude Curves) or TCG (Time Corrected Gain) with a maximum of 16 reference echoes, 4 other curves can be displayed with variable dB intervals. 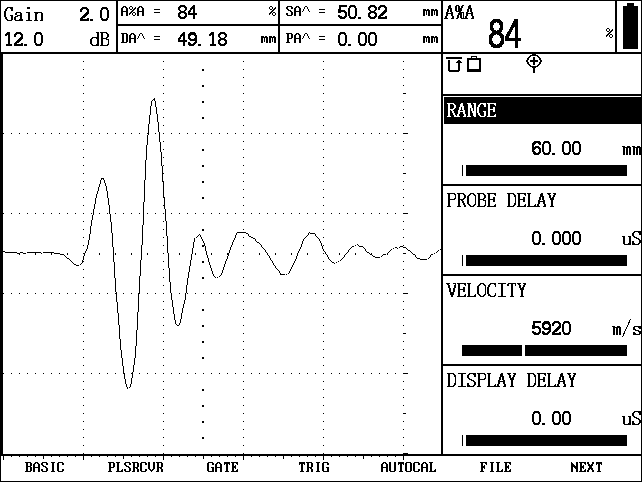 The dB difference between the echo and the recorded DAC curve is measured through gate A. -JIS DAC / TCG: JIS DAC (Distance Amplitude Curves) with a maximum of 16 reference echoes, 4 other curves can be displayed with variable dB intervals, and 2 other curves can be displayed with constant dB intervals. The dB difference between the echo and the selected DAC curve is measured through gate A. The flaw class is evaluated according to JIS Z3060-2002. -AWS D1.1: Provides a dynamic reflector indication rating for various AWS weld inspection applications. This allows more efficient inspections by eliminating manual calculations. -DGS: DGS curves for single-element and dual-element probes and for all materials, sound attenuation and transfer loss correction, 4 other curves can be displayed with variable dB intervals. Backwall, side drilled hole, flat bottom hole type of the reference reflector are used. Equivalent reflector size, dB difference or height difference is evaluated simultaneously. -Time of Flight mode: Peak, Flank and J-Flank. 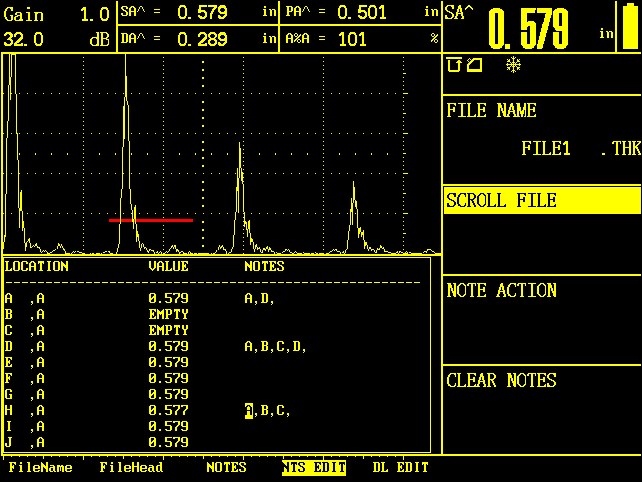 -Auto-freeze function: On hot surfaces you use auto-freeze function, minimizing the probe’s contact time. 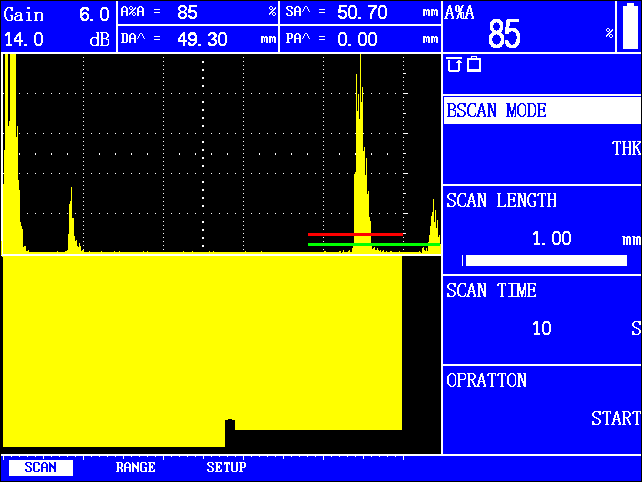 -Measure under freeze status: Under freeze status you still can move gate to measure the echoes to get readings. -B-SCAN: Manual b-scan as an auxiliary tool. -Spike pulser or Square wave pulser. -Spike excitation with low, mid, and high choices of the pulse energy. -Square wave excitation: Pulse Voltage adjustable from 20V to 500 V in 10 V increments, Pulse Width tunable from 20ns to 1000 ns in 10 ns increments. 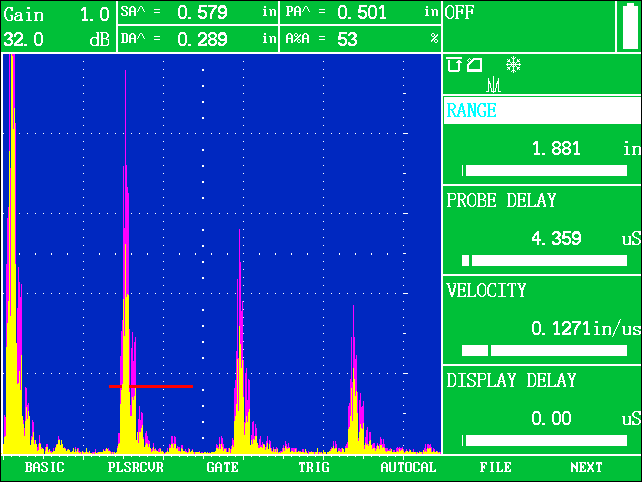 Pulse width tunable in a certain range to match different probes. -Damping: 50Ω, 75Ω,150Ω,500Ω selectable to meet different resolution and sensitivity requirements. 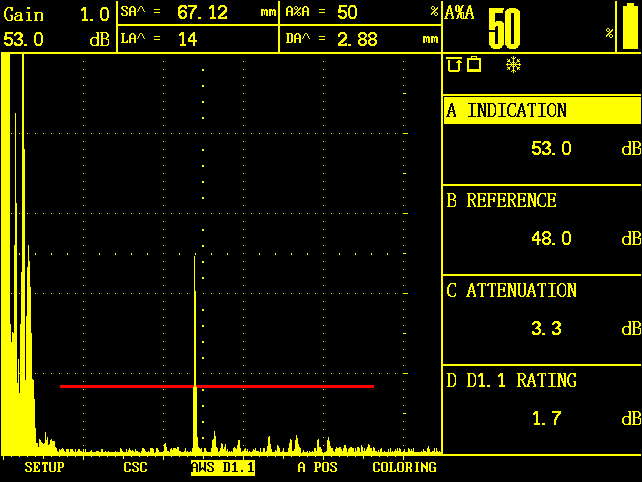 -Pulse Repetition Rate: range from 2 to 1000 Hz. 10 steps available for the setting, step 0 means the lowest PRF value to detect easily phantom echoes. 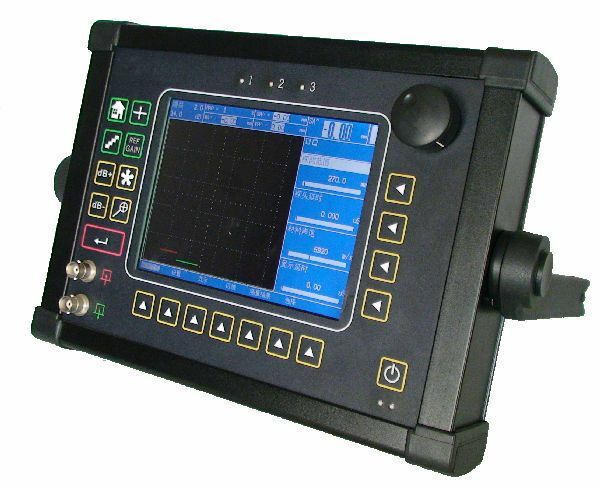 -Probe work mode: Single element, dual element and through transmission. -Gain: 0 ~ 110 dB adjustable in selectable steps 0.2, 0.5, 1.0, 2.0, 6.0, 12.0, user definable, and locked (step 0). -Dialog languages: Chinese, German, English (default setting), Japanese, Korean. S60 combines the digital powerful advantages with the analog high performances. 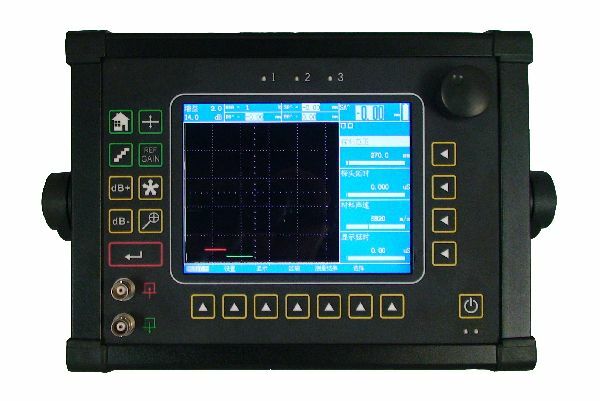 The high resolution (640x480 pixels) color LCD display, 100 Hz update rate, and single shot measurement technique produce a fast, smooth response for immersion and critical weld testing. The quality, durability, dependability and ease of use still remains in this instrument. From rugged field inspections to high resolution thin measurements, long acoustically clean materials, and immersion systems work, S60 extends the range of applications that a portable instrument can perform. Square Wave Pulser selectable and tunable for optimum probe matching to satisfy a wide range of tough-to-penetrate applications. 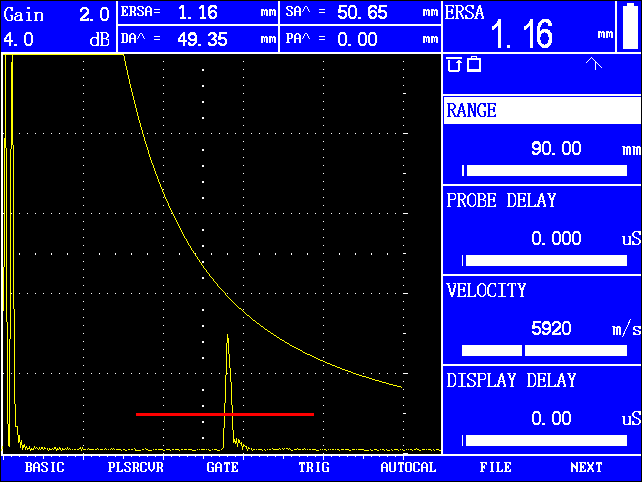 Now, either spike or square wave pulser is user selectable from the front panel. • Spike pulsers are still preferred for everyday use. • For low frequencies, square wave pulsers allow optimum probe matching by adjusting pulse width and voltage. • Difficult to penetrate metallic applications and especially non- metals inspection like composite materials are optimized. • Pulse width is tunable up to 1000 ns in 10 ns steps for optimum probe matching and versatility in meeting a wide range of applications. • Pulse voltage is adjustable from 20 to 500 V in 10 V steps. Rugged durability, great than 8 hours of battery use, fast rotary knob operation, outstanding ultrasonic performance, and now square wave pulser and color leg combine to form a powerful portable ultrasonic inspection tool with new Lithium Ion battery. 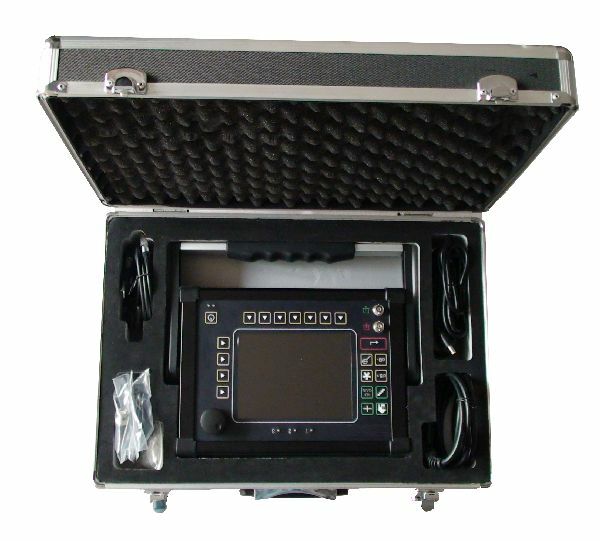 • Hi-resolution (640 x 480 pixels) Color LCD Display with unique signal processing produces “Analog Look and Performance” echo dynamics. • Select from four vibrant display color schemes to match lighting conditions and personal preference. • Choose from eight A-scan colors to relieve boredom & eye fatigue. • Adjust brightness for easy viewing under all lighting conditions. • Gates and gate functions are color coded for easy identification and fast adjustment. • Color Leg allows easy identification of leg and skip distances for weld inspection. • GRID dynamically changes bands of display background colors for each leg. • A-Scan dynamically changes the color for each leg of the “live” A-Scan. • Weld Rating Calculation simplifies the rating of weld indications according to AWS Specification D1.1, (Formula D = A �C B �C C). • Trigonometric flaw location function with curvature correction automatically calculates depth, surface distance, and sound path to flaw along with the leg of the inspection when using angle beam probes. All TOF measurements can be displayed in mm or inches. • Real time (single shot) analog and TTL outputs handle a wide range of systems applications. • Choose from Four Freeze Modes: ALL, Peak Std, Compare or Envelope for optimum waveform evaluation and comparison. • Three Variable Persistence Modes are selectable in Freeze Envelope to visually assist flaw detection & evaluation for scanning and moving part inspections. • Behind-the-Freeze mode allows dynamic time base adjustments on frozen echoes. It also stores additional information both before and after the specified range to enable movement of the frozen image. 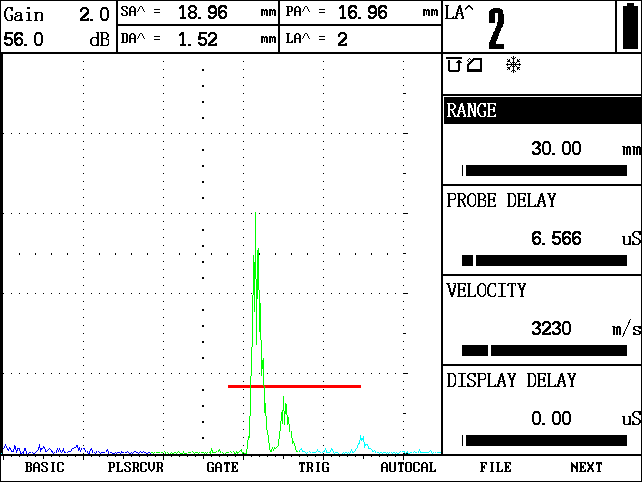 • Compare frozen reference waveforms to live A-Scans in different colors to easily interpret test results. • 40 dB dynamic multiple curve DAC/ TCG Option corrects for distance/ amplitude variations from material loss and beam spread with ability to edit or insert recorded echoes individually. Up to four DAC curves can be drawn on the screen at one time to show +/- dB curves in addition to the originally recorded DAC curve. 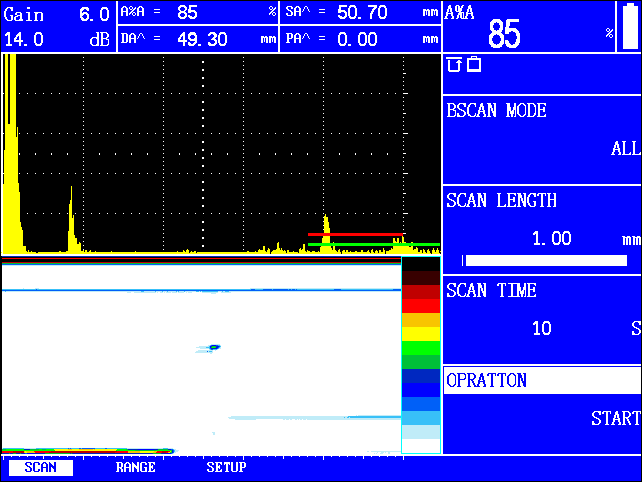 Up to 16 data points can be recorded with a maximum curve slope of 12 dB per microsecond. Meets or exceeds industry requirements for TCG. Multiple curve DAC shows recorded DAC curve in magenta with 4 additional curves based upon dB Offset feature for added flaw sizing assistance. TCG Attenuation and Transfer Correction features make it very versatile for use on other materials and surface conditions. 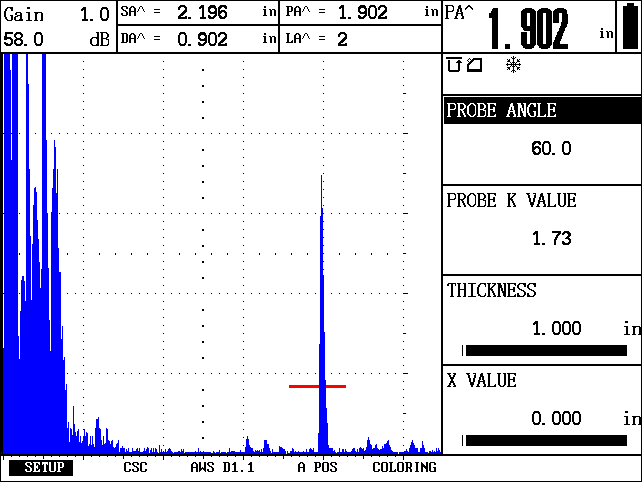 • DGS (Distance Gain Size) Option displays a curve for a particular equivalent reflector size as a function of the distance from the probe to the reflector. The ERS (Equivalent reflector size) function automatically calculates the corresponding equivalent reflector diameter in mm or inches for any echo in the measurement gate. • Simple operation with fast rotary knob adjustments; gain is always directly accessible with the left hand adjustment key and lockable. • 65 selectable material velocities at the user’s fingertips. • 2 independent gates monitor amplitude and sound path distance for both flaw detection and thickness measurement applications. • 250 KHz to 20 MHz capability to match probe for optimum performance. 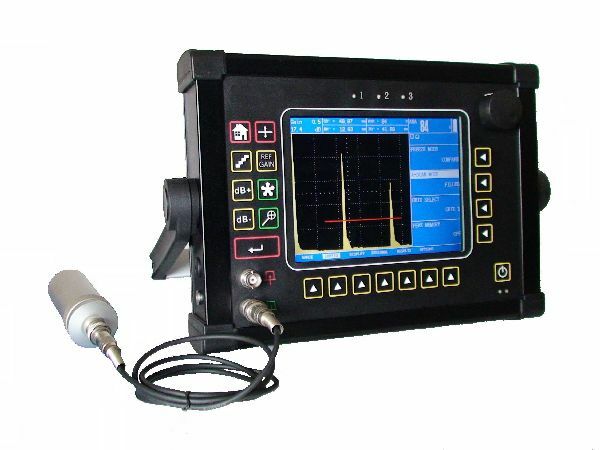 • RF display mode enhances signal evaluation and bond inspection of dissimilar materials. • 4 selectable damping settings (50, 75, 150, 500 ohms) for optimum probe performance. • 0.5 mm to 10 m range (in steel) covers thin to lengthy acoustically clean materials. • dB REF key evaluates subsequent echoes gain value and amplitude against the highest echo in Gate A (reference echo) when activated. • VGA Output Option provides an easy way to connect to a PC monitor or PC projector for viewing by large audiences or training purposes. • Store & preview a minimum of 900 user-named data sets with A-Scans for quick recall and instrument setup. • DU DataPro software program for bi-directional communication with a PC for easy storage of data sets with A-scan and documentation of test results. 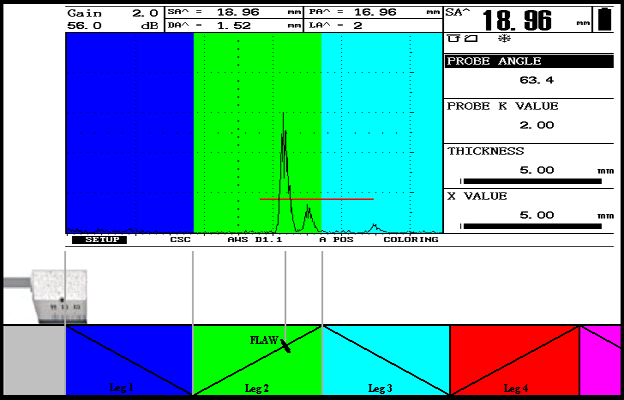 This software program also simplifies the transfer, storage, analysis, and documentation of thickness data. • Reports with A-Scans are output directly to a portable printer. • Alphanumeric Thickness Datalogger for flexible, convenient storage of thickness readings in Linear, Grid, or Custom-Linear file structures with user-input filenames, location I.D.’s, notes, memo, & header fields.